To induct men and women into the Royal Australian Navy, to enable them to think for themselves, work with each other, have the knowledge and skills necessary to conduct basic duties within the fleet and progress to a specialised career in the Royal Australian Navy. To enable sailors to think for themselves and work with each other the school provides them with the many skills needed achieve success in their Naval career. Teamwork, self discipline and professionalism are key attributes developed within recruits undertaking recruit training. Recruits will adopt and display in their behaviour and their attitude the Navy Values of Honour, Honesty, Courage, Integrity and Loyalty. 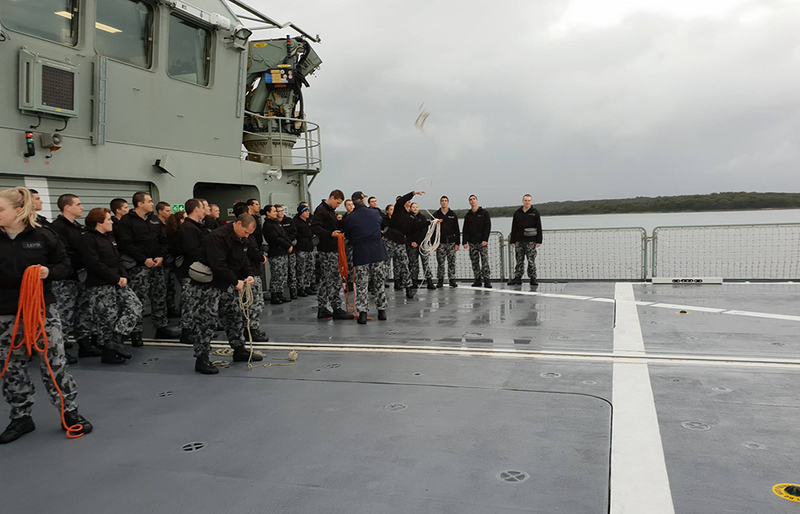 Recruits pictured practicing throwing heaving lines onboard MV Sycamore. The Recruit Course is 11 weeks duration. Much of the training is conducted within Recruit School with elements of the course conducted in other areas of Cerberus such as the Seamanship and Combat Survivability Schools. Recruit training is also conducted on board the Multi-role Aviation Training Vessel (MATV), MV Sycamore. MV Sycamore is a 93.96 metre long ocean going vessel operated for Royal Australian Navy by Teekay. MV Sycamore is employed, in most part, to provide a week of Sea Familiarisation Training to recruits. The training cruises conducted in East Australian Exercise Area (EAXA) operate over 300 days of the year. The Navy recognises the important role that the Recruit School plays in the development of its future sailors. Recruit School staff are volunteers who are selected on application and undertake a three week selection course designed to equip them with the additional skills required for their demanding role as Recruit Instructors.